Agilent Technologies have introduced the PNA-X measurement receiver, a receiver for antenna test applications. The PNA-X measurement receiver has a fast data-acquisition speed. In addition to the fast data-acquisition speed, an optional Fast-CW mode enables a 500-million-point data buffer, allowing users to stream high amounts of data directly to the network. The PNA-X measurement receiver is suitable for antenna test engineers working on radar or satellite communications in aerospace and wireless industries, where large volumes of data are required to characterise complex antenna arrays. The PNA-X measurement receiver also features an optional built-in 26.5 GHz LO source with +10 dBm of output power. The built-in signal source can be used as an LO source for remote mixers or frequency converters. In addition, the PNA-X measurement receiver is compatible with MXG or PSG signal sources of Agilent Technologies as well as the 85309A distributed frequency converter and the 85320A/B mixers. The PNA-X measurement receiver with an MXG source is an alternative to 8530A and 8360 sources for existing antenna ranges and improves system speed. Agilent Technologies PNA-X measurement receiver replaces the 8530A industry standard for antenna test. The built-in 8510/8530A code emulation software is an alternative to antenna ranges using an 8530A. Code emulation minimises the amount of time spent on modifying test code. The PNA-X measurement receiver is built on the Agilent PNA-X network analyser technology platform, the industry standard for microwave network analysis from 10 MHz to 26.5 GHz. The 2- or 4-port network analyser offers a single-connection solution for CW and pulsed S-parameter, compression, IMD and noise figure measurements. An integrated second source, signal combining network, noise receivers, or internal pulse generators and modulators transform it from a pure network analyser to an RF measurement hub for amplifiers and frequency converters. The Agilent PNA-X network analyser leverages all existing features and capabilities of the PNA series of network analysers, including advanced connectivity through LAN, USB and GPIB, an easy-to-use Windows(tm) based open architecture, and an extensive embedded help system. 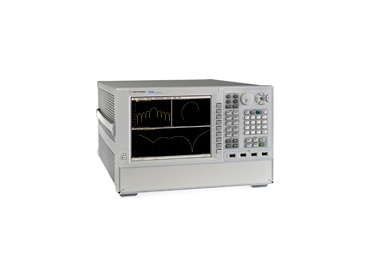 The Agilent N5264A PNA-X measurement receiver is available in two different configurations such as Receiver only and Receiver with an LO source (Option 108). Option 108 provides high RF output power and a fast frequency source that can be used as an LO signal to a remote mixer or frequency converter. An additional option, Time Domain Option 010, displays reflections versus time or distance inside an anechoic chamber and is designed to help users to locate and mitigate reflections inside anechoic chambers.